„ What's It Worth?? „ Standing Room Only! „ Jingle Bells! Jingle Bells! October 28 Sunday Seminar - "Cedar Mountain - Stonewall's Cheerleader"
On September 22, 2007 volunteers with the National Museum of Civil War Medicine (from Frederick, Maryland) in conjunction with the Brandy Station Foundation will present a Civil War Medicine program at the Graffiti House. In anticipation of significant interest in the event, three separate shows are scheduled. The first two shows will be directed towards a Home Schooler audience; these shows will begin at 10:00 A.M. and will not be open to the general public. However, a third show is scheduled to begin at 3:00 P.M. and the general public is invited to attend and participate in that show. In battle, soldiers faced horrendous wounds and life crippling injuries from shot and shell. 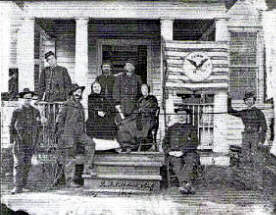 Show attendees will learn how Civil War field hospitals (such as the Graffiti House) provided triage care to wounded soldiers including life-saving amputations. When not in battle, soldiers spent their time in camps and faced many problems with sanitation, disease, diet and insects. These challenges, and how civilians also contributed to the war effort in a variety of ways will be discussed and demonstrated. Come out to the Graffiti House and learn why we should be grateful for every aspirin we take today!! Have you heard about the ghost that haunts the Graffiti House? Over the past four years, we have had about a dozen strange events that have occurred and other visitors have told us of stories that go back 50-60 years. On the evening of October 27th at 7PM, the ghost will be joined by other souls who will tell ghost stories from the time when our States were at War. If you enjoy roasting marshmallows and/or sipping hot cider around the campfire or just enjoy the company of a few expected lost souls, come and join in!! In the event of rain, the campfire will be cancelled; the ghost stories will be told. Donations appreciated. A Northern Virginia developer has requested a land rezoning in Culpeper County on 513 acres of agricultural land that would result in a 3.4 million square foot development with a 20-year build out. The development is entitled Willow Run and is located roughly half-way (3 miles) between the Graffiti House and the Rappahannock River. The development (see map below) located at Willow Run near the Culpeper regional Airport would sit on a portion of the Battle of Brandy Station battlefield (June 9, 1863) The development itself doesn’t threaten the core battlefield (it would sit on the far right extension of Wade Hampton’s battle line), but its creation would create added pressure for other development closer to the core battlefield both commercial and residential. The developer, USA Development, proposes to build office buildings, retail shops, and residential loft units above the shops, commercial structures, restaurants and a theater as well as a private 500 plus-student “international” school. Some of the structures would stand eight to nine stories near the airport and its commercial park. The plan also calls for an equestrian complex and a “fun” water park! For anyone familiar with Central Park shopping center in Fredericksburg along state Route 3 and I-95, this project would be 50 percent larger and, if successful, create even more traffic on an existing four-lane highway. 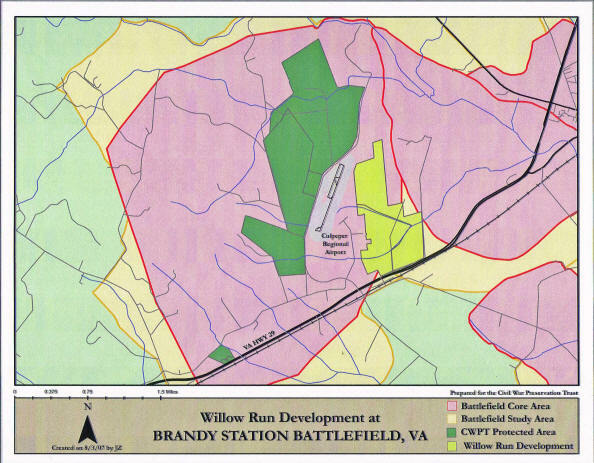 The developer has met once with members of the Brandy Station Foundation Board of Directors one time seeking our support. They later provided copies of their plans and proposal to BSF. USA Development is offering, with no way to hold them to it, to set up a battlefield “visitors” center within the development with donations going to BSF. They also offered to run “daily” bus tours to the Graffiti House. Unfortunately, this level of staffing is currently beyond our ability and desire to support. As an organization, we have serious concerns about the size and scope of this ambitious venture. The BSF board is studying traffic concerns on US Route 29 and the resulting degradation of the battlefield surrounding this proposal. It is feared that if the rezoning is approved, the developer will sell it off and other uses may occur. The proffers provided don’t limit many uses. The matter is still before the county’s planning commission, which is conducting public hearings on the plan. We will keep members advised on our plans regarding this development. Jingle Bells! Jingle Bells! Ho! Ho! Ho! It doesn’t seem possible – but Christmas is right around the corner. 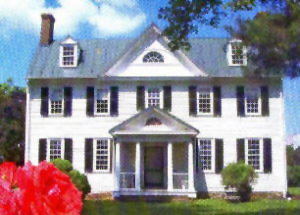 The Annual Christmas Party for the Brandy Station Foundation – and the Culpeper community - will be held Saturday, December 8, 2007 at the Graffiti House. It will begin at 1:00 P.M. and will last till the last elf goes home! Please come and help celebrate the holiday with friends and family. Matching Funds Raised – THANK YOU!! I would like to thank everyone who designated a donation be directed to the Graffiti House Restoration Project. In just a few months, you made it possible for the Foundation to match the funds that were appropriated this year by the Commonwealth of Virginia. This is a true testament to the value that both our government and private citizens place on saving this little historic house. The State funds will be used to conduct numerous studies on what must be done to preserve our National Treasure. The Graffiti Exposure & Preservation Assessment by Kirsten Travers has been completed. We are in the process of selecting an architectural firm to develop a comprehensive plan with estimated rehabilitation cost for the Graffiti House. This study will include a room-by-room survey to identify areas of concern that must be addressed as well as determine what features of the house are original to the structure and should be preserved. Hushed crowds of people gathered around Kirsten Travers, a professional paint preservation expert, watching patiently to see what she would uncover next. As part of a graffiti preservation and paint removal study conducted in July, Kirsten scraped away many layers of paint to reveal Civil War graffiti that had not been seen in 145 years! During her explorations, she uncovered several new sketches, including four horses and the largest human figure to date on the walls, a date, six names, two regimental identifications, and personal comments such as “He Smells A Rebel” and a reference to President J. Davis. During the five-day analysis, Kirsten investigated a variety of paint removal methods to determine the most appropriate technique for removal that would safely and effectively reveal the remaining underlying Civil War Graffiti. Most viewers were amazed at the stability of the graffiti, and Kirsten patiently explained that the material used to write on the walls was a simple element, carbon, in the form of charcoal and pencil. This basic element is one of the most stable found in our universe! So, is the graffiti rapidly fading? No. However, the plaster walls on which the graffiti is written has turned darker since being exposed. Our walls will need to be lightly cleaned before coated with a protective layer that will minimize damage from abrasion and protect them from dust and dirt buildup. But the best news is that there is a lot more graffiti to be uncovered. 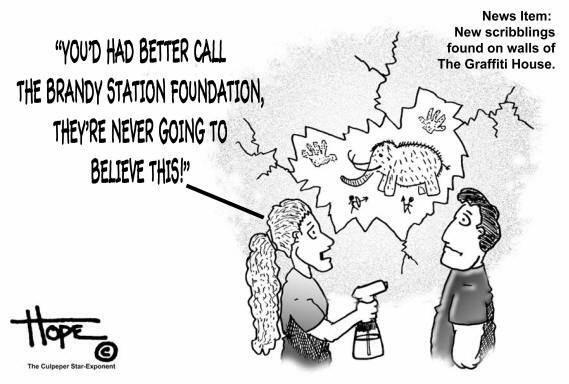 Ms. Travers has submitted a 24 page report to the Foundation in which she has carefully documented present conditions including photographs, reported her findings and made conservation recommendations. At the very least, it will require two months of work to complete this graffiti preservation process. However, this process cannot begin until the house and the old horse-hair plaster walls are stabilized. But the journey has begun!! Click here for more information on Kirsten’s findings!! You won’t be disappointed! Did your ancestor leave his mark on the Graffiti House? If so, you won’t want to miss the 150th birthday celebration next April 18, 2008. Culpeper will be celebrating Remembrance Days beginning with a Graffiti House birthday party on Friday evening, and all descendants of wall signers as well as past Graffiti House owners are invited to attend the party. The party will be held at the Brandy Station Volunteer Fire Department banquet hall and will also serve as the BSF Annual Meeting. Please email graffitihouse@brandystationfoundation.com if you are a descendant of a Graffiti House soldier or a previous owner of the house. It’s time to start planning for the reunion now! Following is a list of the names and units of those soldiers who have been identified in the Graffiti House. Boys Scout of America Troop #196 has been hard at work this summer assisting its senior members obtain the level of Eagle, the highest of levels in the BSA. Although these boys choose laborious tasks, the project is not about hard labor but how the candidate show leadership in designing or finding the project, finding the resources/materials and then getting others, adults as well as scouts, to carry out the project. Along the way the scout must earn 21 merit badges including many specified to help him become a well rounded person - all before he is 18 years old. The Brandy Station Foundation has been the benefactor of this excellent training. Starting in June, Gannon Blanton approached BSF about what he could do for us as his project. As a non-profit, totally volunteer organization, we had no problem coming up with a wish list. From that, he choose to create a good walking path on the Foundation's property along the river at Kelly's Ford. That may sound simple but he choose to civilize a thickly wooded and briary track of land that runs for about 400 yards along the river bank. But with the help of numerous troopers and parents they cleared and opened up the foot track and put down a heavy layer of mulch. One can now enjoy with ease a stroll along the riverbank all the way to the property belonging to the Inn at Kelly's Ford where they have erected historical markers telling of the Civil War events at that location. On one of the few reasonably cooler days in August, scouts from Troop #196 gathered at the St. James Church site near Brandy Station. Their object was to work with scout Jerry Rij for the completion of his Eagle Scout project. Jerry chose for his leadership challenge the reestablishment of the path leading to the site of the historically significant church and its adjourning grave sites. Jerry with ten other scouts and six or so parents first used weed whackers on the path and then shoveled, pushed and unloaded wheelbarrow load after wheelbarrow load of mulch. Their product was a thickly covered mulch path running from the state road all the way to the church. Now a lovely wide path exists for visitors to use to walk in the quite woods and view the historic site. It is located off the St. James Church Road just down from Beverly's Ford Road near the Culpeper Airport..
We are grateful to the Scouts for their wonderful work for the Foundation. It is rewarding to be part of the lives of these young men as they learn skills of organization and other leadership qualities in their achievement of the level of Eagle in the BSA. The Scouts and the BSF both wish to express our thanks to the Rappahannock Electric Cooperative for their donation of the truck loads of mulch they donated to these projects. The August 26th 2007 weather was perfect for retracing Captain William Farley’s last hours on this earth on June 9, 1863. With a dozen horse riders and a wagon full of passengers we moved along under the watchful eye of Culpeper Sheriff's Office. We were glad to have them. There was a lot of traffic on that little country road. Wayne Lenn gave a Southerner's view of our Civil War history along Mountain Run, it was great. Then we all moved back to the picnic area and had a wonderful time sharing horse stories and barn lies. I can only say that all my stories were true!! Thanks to all those who came. We will continue to demonstrate the need for public horse trails with activities such as these. We spy on history! 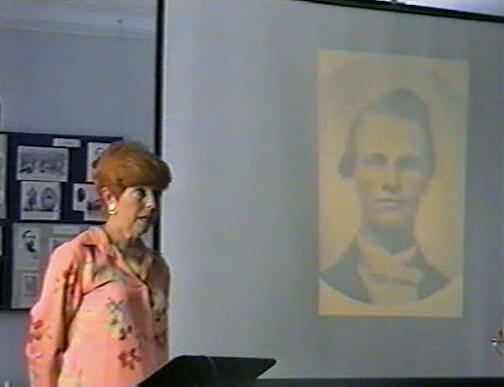 Virginia Morton, author of the popular book, Marching through Culpeper, presented our July Sunday Seminar. A record audience of more than 50 crowded the Graffiti House to hear Virginia describe the lives and exploits of Frank Stringfellow and Will Farley. Both men were “scouts” in the service of J.E.B. 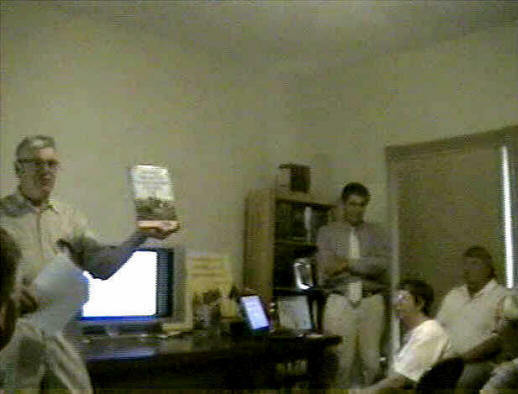 Stuart and their stories were very exciting. Wade Hampton Rides Again. Gary Wilson, our Seminar Coordinator, introduces our August Speaker, Joe McKinney, author of Brandy Station, Virginia, June 9, 1863: The Largest Cavalry Battle of the Civil War. Joe spoke to a standing-room-only crowd about the life of Wade Hampton, one of the leading Confederate cavalry commanders.